Available in sizes up to 90 mm diameter in both round and square styles, lmaoÂ® O.D. Holding Clamps handle irregular shapes and workpieces with circumference. SAE-1045 alloy steel body provides strong, solid base, while 4-part aluminum jaws can be machined to custom fit part. 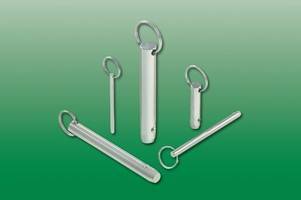 Clamps allow for part repeatability of Â±0.03 mm and jaw locating repeatability of Â±0.02 mm. With clamping stroke of 0.15 mm for each jaw, clamps are suited for use with die cast, extruded, solid-drawn, and prefinished parts. Fixtureworks® (Fraser, MI), a leading supplier of workholding components, material handling products, machine tool components and fixturing accessories now offers Imao® O.D. holding clamps as part of its workholding and fixturing technologies. The O.D. 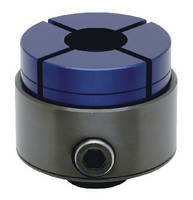 clamps, available in up to 90 mm diameter sizes in both round and square styles, allow for holding on irregular shapes and those workpieces with a circumference. The four-part aluminum jaws can also be machined to custom fit the part, while the body is made of SAE-1045 alloy steel to provide for a strong and solid base. 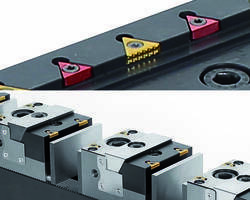 The clamps allow for part repeatability of ± 0.03mm and jaw locating repeatability of ± 0.02 mm, while the clamping stroke of each jaw is 0.15 mm, ideal for clamping die cast parts, extruded, solid-drawn and prefinished parts to name a few. The clamps come with a diamond pin for body locating. The shaft and locking screw are made from alloy steel, hardened with black oxide finish. When the locking screw is tightened the central bottom part of the jaw is pulled down. At the same time the four jaw sections, applying equal pressure, tilt toward the center to clamp the circumference of the part. 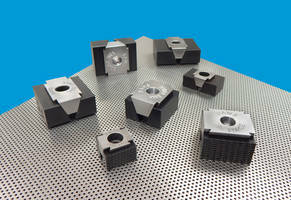 The jaws, also available separately, can be machined to hold almost any shape and many different materials can be clamped. 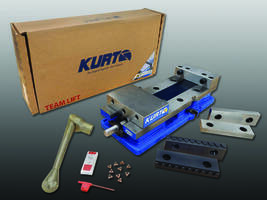 An adapter is also available so that the clamps can be used on a lathe. Ease of use is straightforward. Insert the diamond pin (included) into the body for locating. Secure the body to the fixture with four socket head cap screws. Engage the keyway on the bottom of the jaw. Secure the jaw. Set the locking ring in the jaw. After machining, loosen the locking pin. Besides the Imao® O.D. Clamps, Fixtureworks offers Fairlane® Products full line of grippers, rest pads, Swivots® swivel/pivoting positioning components, Quick Release ball-lock pins, rollers and bumpers; Kipp® rest and riser pads, levers, handles, knobs, and hand wheels; Imao® manual clamps, supports and stops, risers, T-nuts, sliding mounts, springs, supports, grid plates and blocks; OK-Vise® single and double wedge clamp designs; Mitee-Bite® low-profile edge clamps. Imao® O.D. 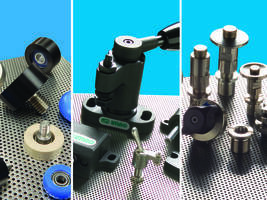 Clamps from Fixtureworks® are ideal for holding on the circumference of irregular workpieces. 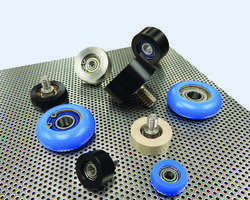 Bearing Wheel Covers come in flat, crowned or radial surfaces.